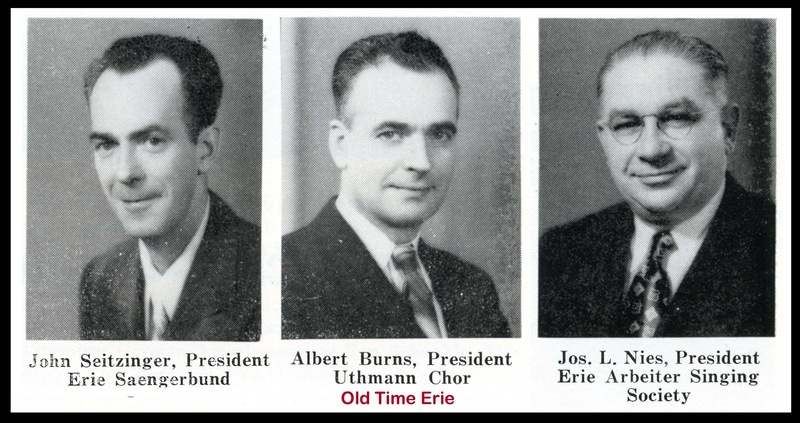 Presidents of Erie clubs in 1950. Allied Trade Club, 1612 State St.
Aviation Club, 3531 West Lake Rd. Cesare Battisti Club, East 3rd & German, then 1602 East 38th St.
Calabrese Club, 509 West 16th St.
City Club, 828 Peach St.
Danish Club, 1146 West 8th St.
Eagles Club, 140 West 8th St., then 2005 West 8th St.
East Erie Turner's Club, 829 Parade St.
Erie Arbeiter Gesang Verein Club, 324 East 18th St.
Erie Improvement Club, 260 East 18th St.
Erie Saengerbund Club, 2501 Peach St. EYE Club, 644 West 26th St.
Foreign War Veteran's Club, 1023 French St.
Gem Social Club, 552 West 4th St.
Golden Chevron Veteran's Club, 340 East 12th St.
Graeco Americus Society Club, 1511 Peach St.
Greek Catholic Slovak Club, 810 East Ave.
Knights of Columbus Club, 1031 State St., then 1023 French St.
Liberty Society Club, 1242 East 26th St.
Lithuanian Alliance of America Club, 806 Parade St.
Machine Gun Battalion No. 313 Club, 1921 Peach St.
Monty Club, 716 West 16th St.
Orioles Club, 102 East 21st St.
Owls Club, 115 West 8th St.
Penn Club, 940 West 4th St.
Polish Army Veteran's Club, 1313 Parade St.
Portuguese Club, 1053 West 5th St.
Pratola Peligna Society (P P Club), 966 West 18th St.
Russian American Club, 262 East 3rd St.
Slovak Catholic Sokol Club, 902 Pennsylvania Ave. Son's of Italy Club, 621 West 18th St.
SPA Athletic Club, 2617 West 12th St.
Ulpia Traiana Club (UTBC- Roumanian Club), 1133 Pennsylvania Ave.
United Veteran's Association, 1805 Chestnut St.
University Club, 230 Peach St., then 1611 Peach St.
Uthmann Chor Club, 2502 Peach St.
Wasn't the Erie Saengerbund Club on East 12th near Parade Street??? I thought the same thing. It set back in beside a diner I can't remember the name of. It was an after hours club-we use to go and listen to bands and dance. Being a musician, I have worked at many of these clubs. Lots of memories looking at the list. I didn't see the Fulton Club on the list...spent a few nights in there making music in the early 70s along with the Polish National Alliance (PNA Club), the Democratic Club on upper Peach (now a bank parking lot. ), the National Club on Cherry St. and the Siebenberger which is still around. There was another club upstairs of Quinn Berry...can't remember the name of that one. The Fulton club still exists ! Yes, that was it-Stan's Dinette. And wasn't the club back in beside there ? There were a lot more. The Moose Club, right by the old City Hall. The Elks Club around 9th and Peach -- they had a blue neon sign that said "B.P.O.E." for Benevolent and Protective Order of Elks, but my Dad always said it stood for "Best People On Earth." There were many more. All the various veterans' clubs. The ethnic clubs were mutual aid societies, basically insurance providers for working class ethnic communities. Many of the other clubs began their existence as speakeasies during Prohibition, then were licensed as private clubs after Repeal so that they could restrict their membership lists and offer bar service on Sundays (forbidden to ordinary bars in Pennsylvania until the 1970s). The clubs made a lot of their money on slot machines, until a crusading district attorney in the 1950s went on the rampage and raided many of them. That, plus the eventual extension of Sunday sales to most bars, drove many of the private clubs out of business. The post-Depression years were the golden age of private clubs in Erie, with many of them hiring live bands and putting on elaborate floor shows. By one account, there were over 60 union bands playing in Erie on a given Saturday night, with more non-union musicians playing in smaller establishments. The advent of TV in the 1950s gradually put an end to this; adult couples began staying home to watch TV in their living rooms, leaving live entertainment to the kids. when did the Eagle's Club close? how many are still open? Aviation Club was originally a country club when that area of Millcreek was all farm land. It was very classy and expensive. I remember going there with some family friends for dinner. Was probably one of the nicest, most upscale, clubs in Erie at one time. My Dad was a member of the Erie Arbeiters but I don't recall it as a singing club. They had slots and a duck pin bowling alley downstairs. Dad and most of his friends there were Polish. I also remember a club called the "Hooksie Dooksie" (not sure of the spelling) where dad and his friend and siblings went to dance. Anyone know that club? Social Clubs, Service Clubs, Hobby Groups, Church Societies....you name it -- they all thrived before television stole our brains, our health and all our spare time. Think what we could accomplish WITHOUT TV....and think about what TV really gives you: at best, it's mostly brainless entertainment that gives you nothing but a couple laughs. Greater World Benevolent Organization? 11 PM 'till 7AM? A club called The Manhattan Club, was not mentioned. Run by Marty Canavan, open 24/7. Except Sunday 1-3PM. Son's Of Italy, left w.18th to relocate on E. 26th., By Elm St. Tommy Rotunda, ran that one too. I think Fat Sam was still there, not sure of the time. If it was pre Ferrito headline days. Damn can't remember another fixture there, projected a nice guy image. Big guy as old as Sam, drove an Oldsmobile, out of the 50's, green and restored. Was Big?, can't remember. About insurance, that wasn't the only thing, these ethnic clubs provided, they helped assimilate like ethnic people to assimilate into American society. If you can look at the early club bylaws of a club you may be a member of (considered immigrant membership, in early days), There were language classes, networking for jobs and starting businesses. Don't forget, back then some jobs were not given to some groups. Olivia McCoy, Hooksie Dooksie is alive and well, same club. Pulaski Club, 2114 Wallace St. Wallace is between Parade and Ash, 4541311. Karaoke Fri. and Sat. Cheap drinks, friendly people some maybe considered local celebrities. Age range from 20's to at least young 80's, young acting, in a good way. The name, this is my own opinion based on members telling me of some of it's history. Pulaski Club is a member of the Pulaski Club organization. Probably when the troops came back from war, is when it got that nickname. Think about it, dukes as in put 'em up. Hooksie, a hook in boxing is like a roundhouse kick, but with a fist. Loosely interpreted, it maybe was a place you could get one for free, wanted of not. Why do I say this? It was also known as "The Bucket Of Blood". They had, at that time, from what I was told, sawdust on the floor to soak up all the blood. Fighting was common in there. Young guys just before it was known as that, went to a global war, instead of post secondary or a job. No internet, what could prepare them for what they would see and feel. My dad screamed every night until he died, yelling orders to people to save them. Yet, he never told me what he saw. Back then people didn't say anything, about anything. Like Hank Hill by the fence, with his friends, saying yep. I remember the Arbeiters Club. I was a road musician working with 'Dante and the Irresistible's' in 1965/66 (? ), and we were booked there for 3 weeks. We played from 8 til' 1 from Monday thru Saturday. The main bartenders' name was Paul, and the guy who ran the club was Davey Yeulinger (?spelling). He regularly took us to the after hours club 'The City Squire Club', which was run by Pat Ferrara. Those are great memories.